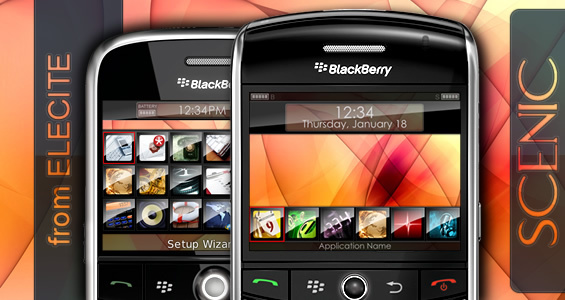 Elecite has released a new free BlackBerry theme for a wide array of devices. Scenic was designed and released for free as a show of appreciation to all Elecite customers, and as such the staff of Elecite have asked we pass along a message to you all. "As a team here at Elecite, we have decided to give away one of our latest themes absolutely free as a huge thank you to all of you Elecite supporters for making it the hottest theme site around. If you've never taken one of our themes for a spin, here's your chance." The Scenic theme comes with 5-6 bottom dock icons and an assortment of over 50 beautiful icons to dress your BlackBerry with a VERY wallpaper friendly choice. Currently all BlackBerry Smartphones are supported with the exception of the BlackBerry Pearl 8100 series. Check it out and please be sure to leave your comments about the theme.